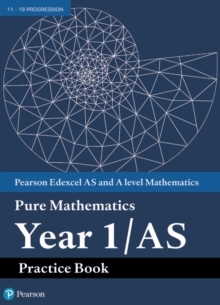 Our A level Mathematics Pure Year 1 Practice book is a brand-new addition to the market leading and most-trusted resources for Pearson Edexcel AS and A level Mathematics, to help you get exam-ready. Coverage: The practice workbooks cover all Pure, Statistics and Mechanics topics, reflecting the style of questions seen in the summer 2018 exams. Quantity: The most A level question practice available, with over 2000 extra questions per book. Practice at the right pace: Start with the essentials, build your skills with various practice questions to make connections between topics, then apply this to exam-style questions at the end of each chapter. Get exam-ready with confidence: Differentiated questions including 'Bronze, Silver, Gold' in each chapter, and a mixed problem-solving section for each book, will guide and help you to develop the skills you need for your exams. Designed to be used flexibly, the practice books are fully mapped to the scheme of work and textbooks so you can use them seamlessly in and out of the classroom and all year round. Use them lesson by lesson, topic by topic, for homework, revision and more - the choice is yours. Great value practice materials that are cheaper than photocopying, saves more time than independently sourcing questions and answers, and are all in one place.